And on the fourth day of Christmas . . . the rain continued, so my humans decided that it was time for me to get my first pair of waterproof dog boots. They are called Pawz, made by Top Paw, and I am still a bit undecided. 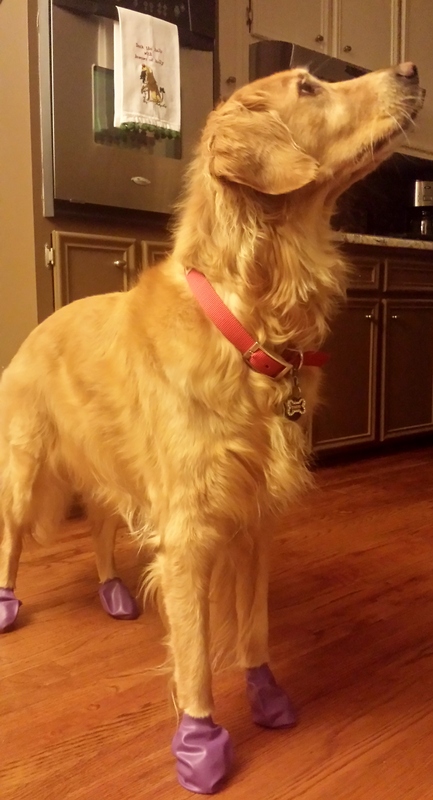 My fabulous Golden friend Sugar wears Pawz year-round to protect her beautiful feet. (You can click here to read all about Sugar and her famous Pawz.) I figure if Sugar likes them then they must be good. The fact that they are purple is a plus, too. Purple is my favorite color. My new boots took a little getting used to. My humans started by putting just one boot on one foot. At first, I didn’t want to move. And then I didn’t want to put the booted foot on the ground. Then I got used to one boot, so the humans tried them on all four feet. Walking was a bit tricky at first, but I got the hang of it. Then I wouldn’t sit down with my boots on, but eventually I sat. I even went outside to . . . well, you know . . . wearing my Pawz. And finally I gave in completely and wore the boots to my bed to lie down. That’s when, mercifully, my humans removed the boots and said that we’ll try them again tomorrow. While I’m not completely averse to wearing my new waterproof boots, I do I have my toes crossed for brilliantly sunny skies and dry ground tomorrow. A girl can dream. We all have those boots too, but we only wear them when it is seriously below zero outside because that cold hurts our paws. They look great on you! What size did you buy? I wanted a pair (a quad?) for Harlow but am not sure on size. She’s a very small Golden. Oh good job. Torrey has shoes too, and she loves them. There is certainly an adjustment period, but the effort is well worth it to keep those pads in top shape. Good luck! We hear you about the rain! Seriously enough is enough and now it’s COLD! LOL! I’d freeze if I lived up north. ☺ I’ve thought of getting Bentley a pair, but his feet are so big, I’ll have to try them on him. His pads were cold and wet after going out to do his business today. Did she go with you to try hers on or did you guess at her size? You are very brave Miss Harper Lee. Mom has tried these on Anne since she has problems with the cold and her feet, but she just lies on her side and refuses to get up MOL! Love them, you will get used to them. I bet you will get used to them.